Well, you can breathe easy on this topic when coming to Breckenridge. Here is our list of free in-town activities for toddlers. You can enjoy each of these activities for as long as you like and easily make it back to your resort for naptime. Located on Main Street, this park is the perfect place to let the kids run around after lunch or while mom is off doing some retail therapy. The slide, tunnel, spiderweb net and bear are complemented by stunning views of the Ten Miles Range. The parking lot located directly across Main Street helps make this park extremely accessible. Peak-A-Boo Toys is a toy store located on Main Street. While it may seem counterproductive to take a child into a toy store, this indoor play area will entertain the kids for hours. In the back of the store, Peak-A-Boo Toys has an art table, a train table featuring Thomas the Tank Engine, a play kitchen and miscellaneous toys like puzzles, Legos and blocks. BUT most importantly they have a giant octopus with a kiddie slide and two trampolines! This 1.5 round-trip hike begins at the bottom of the Snowflake Lift. The trail runs along a stream and ends at a small reservoir. Trees line the hike and provide plenty of shade along the way. There is small gradual incline gain totaling 240 feet but nothing that most kids can’t handle. Not sure if this hike will be a good fit? Watch a short video recap of this trail here. 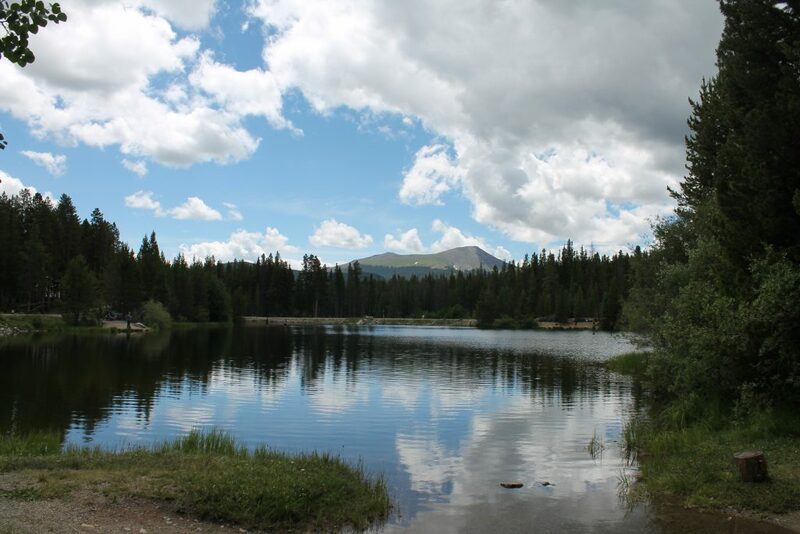 The BreckConnect Gondola runs from 9 a.m. to 6 p.m. and is a wonderful way to see the town of Breckenridge and Peak 8. This is free of charge, and one pod can hold up to eight passengers. This scenic ride runs over Cucumber Gulch, past Peak 7 and ends at the base of Peak 8. At Peak 8 you will find Epic Discovery (this is not free), Robbie’s Tavern and stunning views. 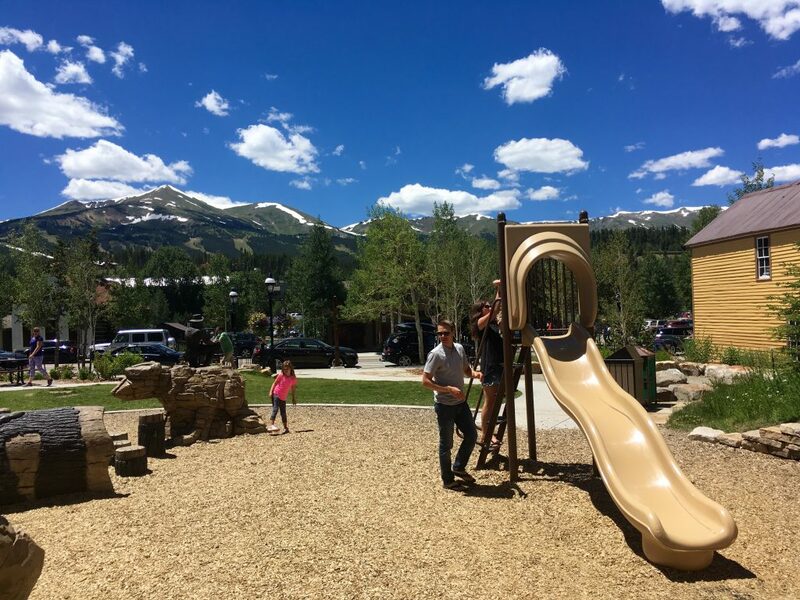 There is a small playground area that is free of charge and a perfect place for the kids to play while you take in the views. Located off Boreas Road beside the Stephen C. West Ice Arena is a hidden gem of a park. This railroad-themed playground has a little something for everyone. Engine No. 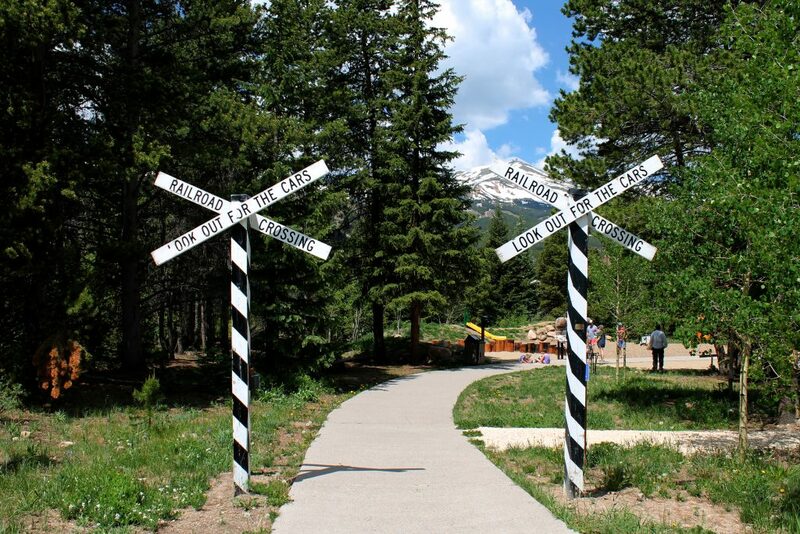 9, a locomotive, which served Breckenridge for over 50 years, is located at this park, along with historical plaques that describe Breckenridge’s railroad history. For the kids, you will find a “mining cave,” a play train car and some other railroad-themed items for them to play on. The Summit County Library offers a variety of weekly activities that are free and for children. Story time and coloring time are two of the weekly options. The Breckenridge Grand Vacations Community Center also has a children’s area with books, DVDs, a play area and a sitting area. For the older kids, there is a junior’s area and a teen’s area. The activities offered change frequently but enjoying a good book is always a great option for a rainy afternoon. Go here to learn more about the weekly activities. Grab a blanket, some snacks and head on over to the Riverwalk lawn. Here you will find green grass, easy river access and plenty of room for the kids to run. 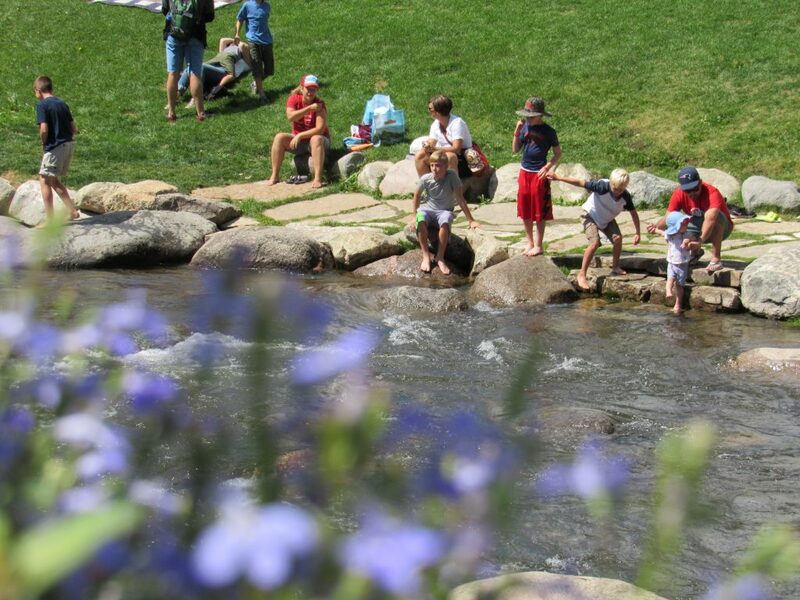 The lawn is next to a rock sitting wall that makes it easy for the kids to dip their feet into the river and splash around (with adult supervision). From playing catch to soaking up the sun, the entertainment options are endless. Pets are not allowed in this area, so if Fido is along for vacation, he will not be able to enjoy it.